The past several days have been so beautiful. Sunny, breezy… almost warm. 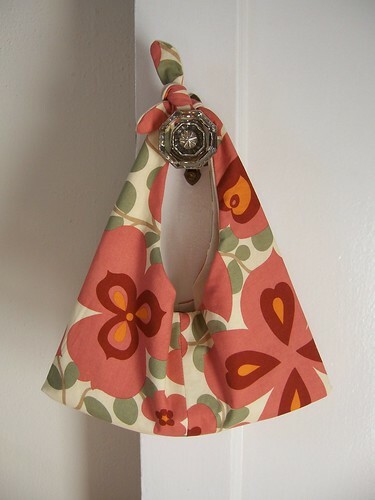 It inspired me to do some spring sewing this weekend–when we weren’t outside enjoying the weather, that is. Meet my new Tokyo Tie Bag, from Sew Everything Workshop. It’s very cute! Fabric Depot is so where we’re going when I’m there this summer. I can hardly wait. the bag is so lovely!! 🙂 wish i know how to sew. btw, did you get my reply on the addy? It is lovely and pity about the washing, do you think it was Scotchguarded and that is why it went like that?…I did a similar one in various upholstery fabrics and it is a great shape isn’t it….totally with you on the alterations next time too, I put a loop and button closure the next time I did it. It’s more than pretty good!! It’s gorgeous! I don’t wash fabrics before using them anymore. I love the fresh smell of new fabrics. Emily, please accept “You make my day” blog award. You really make my day! You are always so creative! 🙂 Congratulations! Very cute. I made the mistake of washing a canvas tote that I got awhile back at the farmer’s market, and it hasn’t been quite the same since. I’m not sure I understand why canvas gets so wrinkly and stiff like that. Cute! Love the fabric. I’ve done the same thing with canvas. My grocery bags became little book bags. Don’t put it in the dryer, don’t use warm or hot water! Next time cold water, gentle cycle, hang dry. OK, now I must browse more of your posts, nice site! Very cute. I love her stuff, but haven’t gotten around to making anything from a pattern yet. Great job! Cute, CUTE bag! I’m so glad the tutorial helped! I put in several before I got my own method down. I’m not sure why the snaps don’t come with directions. I think that’s the nicest use of this Amy Butler print I’ve seen. Nice job.